Please note that this feature is available exclusively to users of ReadyRoll Pro. ReadyRoll supports SQL Compare-compatible filter rules, which provide a simple way to control the inclusion of objects within the script generation and reporting processes. Filter rules provide the flexibility to allow both include and exclude rules to be specified for your project. Authoring the filter rules themselves can be done using the SQL Compare UI or by editing the filter files directly within a text editor (e.g. using the Visual Studio Xml document editor). This feature, introduced in version 1.15.17340, deprecates the ExcludeObjectsFromImport project setting. The legacy method will eventually be obsoleted in favor of the approach defined in this article, so we highly recommend moving your filter rules over to the new format as soon as practical. For more information, see Excluding Database Objects (Legacy method). By default, ReadyRoll will import all objects from the connected database when you use the ReadyRoll tool-window to generate scripts. Although you can selectively un-check objects that you do not wish to import, thereby excluding them from your deployment, it may be desirable to exclude certain objects from the import tool altogether (e.g. to prevent any changes from being accidentally re-selected for import). It may be desirable to have ReadyRoll exclude entire schemas from the tool that may, for example, contain objects that are controlled by a third-party. Use SQL Compare's filter designer to configure filter rules, and then export the rules to a file called Filter.scpf within the root of the ReadyRoll project folder (i.e. alongside the .sqlproj file). When the ReadyRoll tool-window is used to import new changes, the rules defined within the filter file will be applied: any objects that do not satisfy the rules will be excluded from the generated migrations, programmable objects and/or offline schema model. Open the project within Visual Studio and, within the ReadyRoll tool-window, click Refresh. Using the Filter editor, specify any filter rule customizations as needed. The list of objects in the comparison pane will automatically update to reflect rule changes. Within Visual Studio, close and re-open the project/solution. Within the ReadyRoll tool-window, click Refresh. Note that the list of objects is now reduced to those specified in the filter rules. To edit the filter files after the initial setup has been performed, simply re-open the filter file within SQL Compare, make any necessary edits to the rules and click the Save icon within the Filter pane to overwrite the filter file. When editing an existing filter rule file, there is no need to close and re-open the project in Visual Studio; any changes will take effect once you save the file and click Refresh or Import within the ReadyRoll tool-window. In some situations, it may be desirable to specify a different filter path, depending on the calling context. For this purpose, ReadyRoll provides the DatabaseObjectFilterPath MSBuild property setting. For example, when configuring your build server to report on schema drift in the QA environment, you might want to exclude all user objects. But when reporting on drift in production, you may want to report on all objects within the environment. This can be achieved by utilizing a different filter file per environment (Filter_QA.scpf, Filter_Prod.scpf etc). 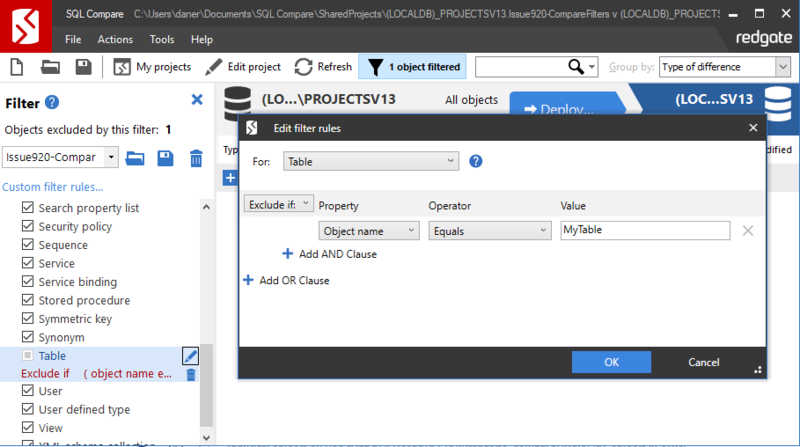 The DatabaseObjectFilterPath property can be specified by adding it to a property group within your sqlproj file (e.g. <PropertyGroup><DatabaseObjectFilterPath>$(MSBuildProjectDirectory)\MyFilter.scpf<DatabaseObjectFilterPath></PropertyGroup>), or by supplying it as an argument to MSBuild in a continuous integration environment (e.g. /p:DatabaseObjectFilterPath=C:\FilterDir\MyFilter.scpf).